Today, we are pleased to repost a piece from Comeback Town, a blog that aims to “begin a conversation about a better Birmingham.” We’d like to thank Comeback Town’s editor, David Sher, for featuring our 2018 State of the South report on his blog–especially since the guest writer is a former MDC intern, Natalie Pickett. Natalie is an Alabama native who just completed her Master of Social Work degree from Appalachian State University. She is now a community social worker in Durham, North Carolina. I live in North Carolina now, but I visit Birmingham frequently to see my parents and siblings. When I moved away in 2011, downtown was starting to change. Railroad Park and Good People had just opened. The Barons were moving downtown. The Lyric underwent exciting renovations and Iron City was on the way. My family and I went from going downtown only for dance recitals and the McWane Center to frequenting Pepper Place and WorkPlay. When I introduced myself to new college peers, I proudly said I was from Birmingham—mostly because it’s more recognizable than Hoover, but also because I wanted to belong to a cool city like Birmingham. Seven years later, I now have a degree in social work and the beginnings of a career in nonprofit services with historically marginalized populations. I’ve lived in four metropolitan areas across the Southeast, including Birmingham. Professionally and personally, I am interested in how urban areas, particularly in the South, are currently experiencing periods of rapid growth and development. I am further intrigued by the issue of equity—who is benefiting from revitalization? Who might be harmed by it? And most importantly, what will it take for all residents to have the opportunity to benefit from and contribute to their city’s revitalization? Birmingham, Baton Rouge, Nashville, Durham—the wonderful Southern cities I’ve called home—they are all asking these questions. I don’t know of any city that is not. We are all grappling with how to revitalize and prosper without unintentionally pushing out our long-term and historically marginalized residents (i.e. our neighbors who are people of color, low income, elderly, disabled, etc.). Birmingham is still young in the life cycle of urban revitalization in the 21st century. It could be the Southern city that gets it right—that invests in developing its native talent as much as attracting new talent from out of state or over the mountain. But these solutions do not happen by accident or by good intentions alone. It takes innovation, commitment, and courage—three things I know Birmingham has. I live in Durham, North Carolina, and just finished an internship with an organization called MDC, which recently released its State of the South 2018 report. MDC’s President, David Dodson, presented it to the Birmingham Rotary Club recently, where its findings were well received—and also eye-opening. The report found that in every state in the South there are more people coming from out of state who have college degrees than the number of people who were born there. In Alabama, based on 2016 American Community Survey estimates, just over 20 percent of folks born in Alabama have a Bachelor’s Degree, compared to nearly 35 percent of people who moved to Alabama from somewhere else. If we are going to create a prosperous and equitable Alabama, we must commit to strengthening public schools, community colleges, and universities within our state, rather than fostering a heavy reliance on imported talent. The report looks back at what things were like in the 1960’s and finds that the South is doing better, but has a long way to go to put everyone on an equal footing. In 1970 in Alabama, fewer than 5 percent of African Americans had a bachelor’s degree, compared to around 10 percent of Whites. By 2016, the number of African Americans with a BA had risen to nearly 20 percent, while the number of Whites was nearly 30 percent (the U.S. average in 2016 was over 20 percent for African Americans and nearly 40 percent for Whites). For African Americans, the result was an increase in household income of over 50 percent in that period, but the increase still needed for African Americans to have Black-White parity is over 150%. In other words, we’ve made great progress, but we still need to address persistent disparities and improve educational attainment for everyone if all Alabamians are to be competitive in a national and global marketplace and earn family-sustaining incomes. The State of the South report uses three lenses to address these issues facing the South: belonging, thriving, and contributing. Belonging means full participation in civic and economic institutions by all Alabamians, especially as rising generations are becoming more racially and ethnically diverse. Thriving means removing the structural barriers and building the support systems that will generate wealth for everyone and spread its benefits. And contributing means the engagement of once-marginalized voices who can define their own priorities. That means Alabamians must find the courage to recommit to action that will engage progress, not backsliding. As the report says, we must build an “infrastructure of opportunity”—clear pathways to connect young people with educational credentials and jobs that pay a family-sustaining wage. We must create relationships between our cities, suburbs, and countryside that can connect them and provide opportunities for everyone, regardless of where they live. We need to make it so our education systems and employers work together so both can be competitive in the marketplace. And we need to recognize and address the shifting demographics of increasing racial and ethnic diversity. Like I said, I’m from Hoover. My family could afford to live in the suburbs, in the “Birmingham Metro Area.” I’ve never lived in the City of Birmingham. My privilege allows me to claim the Magic City as my hometown, and its revitalization has only made me more excited to do so. My upbringing was largely unaffected by anything that happened in downtown Birmingham. We visited when it was convenient and fun. Since then, downtown has become more convenient and fun for more people, which is a good thing. But for the downtown natives (and Avondale natives, Crestline natives, Southside natives, and so on), the city of Birmingham is home, through thick and thin. If these folks don’t enjoy the fruits of the new revitalization, if they can’t access opportunities to contribute to Birmingham’s thriving, Birmingham will lose its way just as so many other metro areas—in the South and across the country—have begun to do. Today’s guest post on criminal justice comes to us from Abby Reimer, a journalism major at UNC-Chapel Hill’s School of Media and Journalism and a business minor at Kenan-Flagler. Incarceration disrupts the educational trajectory of young people, and erects barriers to employment and economic security. While funding for public education is cut in the South, state corrections spending continues to rise, exacerbating the challenge for communities trying to address low mobility. In October 2015, President Obama headed to Charleston, W. Va., to launch a “criminal justice tour,” a high-profile spotlight on criminal justice reform across the country. It is significant that the tour started in the South, where the problems of America’s criminal justice system—racial inequity, harsh sentencing laws, and overcrowded prisons—are most visible and entrenched. In recent years, Southern states have joined the increasingly bipartisan effort to address prison overcrowding, high costs, and prisoner reintegration. Like the rest of the country, the South has seen a significant drop in both violent and property crime during the last 20 years. From 2013 to 2014, the South saw a 5.9 percent drop in property crime and a 3 percent drop in violent crime, a slightly smaller decrease than the rest of the country. While decreasing, the South has a long history of being the U.S.’s most violent region. In 2012, the South accounted for 40.9 percent of violent crimes in the country, while its population makes up 37.4 percent of the country. Nationwide, the drop in crime has been attributed to a smattering of factors: aging populations, decreased alcohol consumption and up to the mid-1990s, increased incarceration. African Americans, in the nation as a whole and in the South, are overrepresented in all parts of the criminal justice system, from traffic stops to incarceration. In Alabama, Georgia, Delaware, Louisiana, Maryland, Mississippi, North Carolina, South Carolina and Virginia, more than 60 percent of those serving life sentences are black, a rate shared by only four Northern states. The South also carries the distinction of having the largest prison population in the country, almost doubling the incarceration rate in the Northeast. Louisiana is the world’s “prison capital,” incarcerating 1 in 75 adults, the highest rate in the world. However, prison populations have declined slightly in Southern states during the past few years, even as prison populations have grown in northern and western states. Mississippi, South Carolina, Texas and Alabama are policy leaders in reducing prison populations. The recent reforms show a path forward for conservative, traditionally “tough-on-crime” states to tackle criminal justice reform. Leaders in the state emphasized cost savings and “common-sense” reforms, while not addressing more politicized issues like racial inequity and the death penalty. Mississippi, which still has one of the highest incarceration rates in the world, saw its prison population fall 21 percent between 2008 and 2014, with a 14 percent drop from 2013 to 2014 alone. The state passed a sweeping reform bill in April 2014, supported by a grant from the Justice Reinvestment Initiative (JRI), a partnership between the Department of Justice and the Pew Charitable Trust to help research criminal justice reform. The bill shortened the sentences for many property and drug crimes and suggested new sentencing recommendations for officers. The state also increased supervision of parolees, increased the number of prisoners freed on parole and opened technical rehabilitation centers, which housed parolees who violated terms of their parole rather than sending them back to prison. Conservatives in the state emphasized the financial impact: $266 million in savings over the next decade. South Carolina’s prison population has nearly tripled in the past 25 years, and state spending on prisons has increased almost 500 percent since 1983. Faced with a projected growth in prison population and a $27 million Department of Corrections deficit, South Carolina passed a reform bill in 2010. The bill shortened sentences for some non-violent crimes, ended mandatory minimum sentencing for drug possession and expanded prison alternatives and parole. From 2011 to 2014, crime dropped 14 percent and the prison population dropped by 6 percent. Texas faced similar financial pressures in the mid-2000s. Prison population growth showed no signs of slowing down, and would have required spending $500 million on new prisons in 2007. The state responded by appropriating $241 million to prison alternatives including drug courts and substance abuse and mental illness treatment programs. In 2011, the Texas legislature passed two bills that shortened probations if parolees completed treatment programs and reducing prison sentences if prisoners completed educational programs. Texas saw a 12 percent drop in crime from 2011-2012 and a 3 percent drop in prison population. The Republican-controlled government emphasized savings and assured conservatives the state was still “tough on crime.” In March 2014, Republican Gov. Rick Perry spoke about criminal justice reform at the Conservative Political Action Conference (CPAC), assuring the crowd that criminal justice reform was a mainstream conservative strategy. Alabama is the most recent Southern state to tackle criminal justice reform. The state was faced with the same mix of budget constraints and booming prison populations, as well as lawsuits from The Southern Poverty Law Center and The Equal Justice Initiative contending that some state prisons did not meet constitutional standards. The Department of Justice backed up the claims, filing a report in 2014 that claimed that inmates at a women’s prison were subject to sexual abuse by male officers. 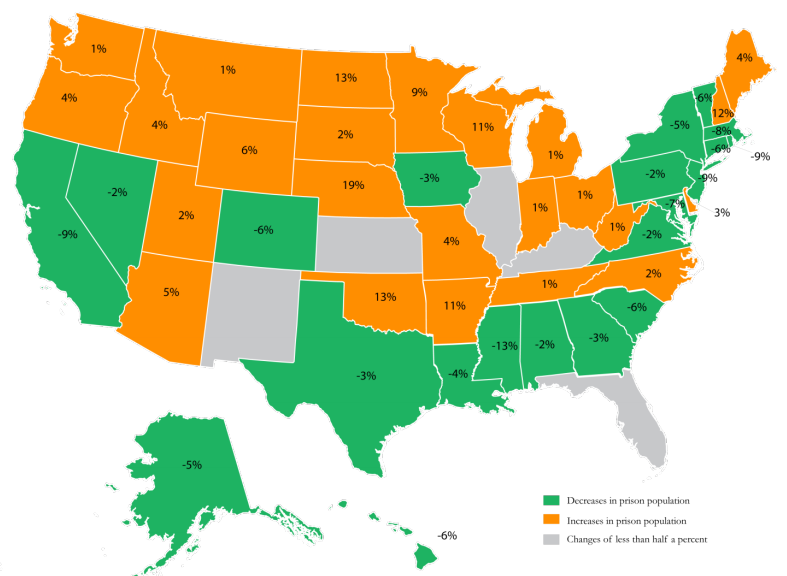 In May 2015, the state passed a Republican-sponsored bill that followed the strategy of Texas, South Carolina and Mississippi: reducing penalties for some nonviolent property and drug crimes, creating a new felony designation for some nonviolent offenses and prioritizing parole and parole supervision. Alabama also passed a bill expanding prison capacity. The reforms are estimated to save the state $380 million and reduce the prison population by 4,200 people. 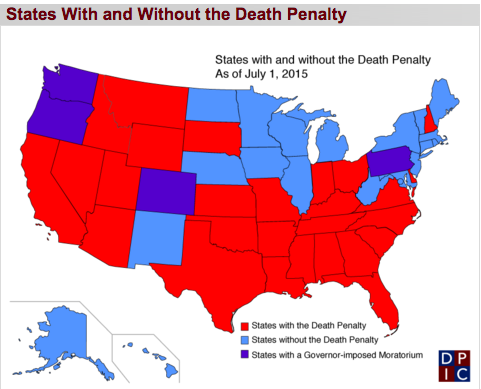 The death penalty: part of the ‘Southern way of life’? Southern states have been slower to change death penalty policy, which has largely become Southern in use. While the death penalty largely faded away from 1935-1972, the 1972 Supreme Court case Furman v. Georgia reinvigorated the death penalty as a “states’ rights” issue in the South, said Frank Baumgartner, who studies the death penalty and racial inequity in the criminal justice system at UNC-Chapel Hill. Racial discrepancies in the death penalty still loom large. As of Jan. 1, 2014, 42 percent of defendants on death row were black and 43 percent were white, although blacks make up only 13 percent of the U.S. population. When the victim is a black male, the death penalty is rarely applied even when black men are the most common victims of homicide, Baumgartner said. A black man who kills a white woman is the most likely to be given the death penalty. While death penalty reform or abolition hasn’t been backed by the same bipartisan push as prison or sentencing reform, there has been some movement on the issue, Baumgartner said. An upcoming Supreme Court case dealing with racial bias in juries may change the application of the death penalty, Baumgartner said. In North Carolina, for instance, of the 159 prisoners on death row, all-white juries sentenced 31 and another 38 had only one person of color on their juries. The South has long been a ‘tough on crime’ region with stark racial disparities in its criminal justice system. However, recent reforms in conservative states show an increasingly Republican-led push for lowering prison populations, changing sentencing laws and cutting costs. Bulging prison populations, drug law enforcement and high criminal-justice system costs will push more Southern states into reforms.